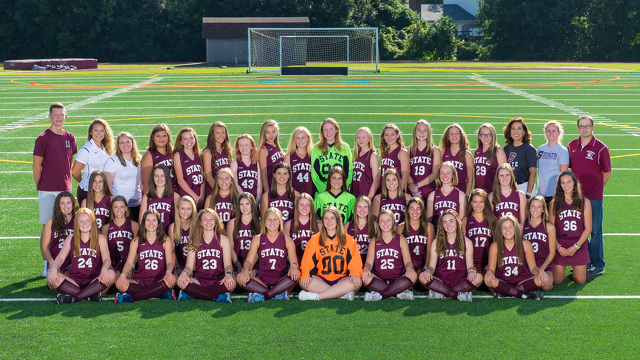 STATE COLLEGE — Field hockey has one of the shortest seasons in high school sports. In just under two months and 19 games, the State High field hockey team improved themselves in everything on and off the field, impressing head coach Beth Mink along the way. And, their play was impressive enough to earn them their third straight District 6 title. The league the Lady Little Lions play in is a notoriously competitive conference and division. Even against such difficult competition, the team stepped up and grew after every game. The team finished its regular season 9-9-1 overall and 7-5-0 in league play — improving over an 8-10 season the year before. The Lady Little Lions’ performance during the regular season made them District 6 champions for the 2018 season for the second season in two years under Mink and a third in 2016. The District 6 champions were then scheduled to take on the champions from District 3, the district that has produced the last five state champions. Though Exeter ended the team’s season, multiple players were recognized for their play. Senior midfielders Kelsey Love and Sally Stahl both earned Mid Penn All-Star First Team selections. Junior Libby Fortin and sophomores Rebecca Bonness, Jojo Lee, Maddie Tambroni and Kyra Whitlark each earned honorable mentions. The two seniors will continue their athletics careers in college. Love is committed to Penn State to play field hockey, while Stahl is committed to the UMass lacrosse team. State High’s senior goalie, Grace Biddle, also has committed to play collegiate field hockey at Bates College in 2019. In all, the team will graduate eight seniors in the spring, including captains Stahl, Biddle and Ava Whitlark. Mink and her coaching staff made sure to spend time with their team working on things they’d need once they put down their sticks. With the team graduating eight senior leaders this spring, teaching these things to them and the rest of the team was important to Mink. Those lessons also will help the three rising seniors; Libby Fortin, Kendall Kleinman and Morgan Marshall have the confidence to take over that leadership role along with rising juniors Bonness, Lee, Tambroni and Kyra Whitlark. Heading into next season, Mink hopes to add to the improvements the team made during the second half of this season. For next fall, Mink has high expectations for the Lady Little Lions. “(In 2019 our goals are) winning District 6 again and going further in the District 3 playoff,” said Mink.